My second book will be here very soon! If you want an autographed copy, and you want it as quickly as possible, you can pre-order it on my website here now. I'll ship the books out as soon as I get them! Point, Click, Quilt! 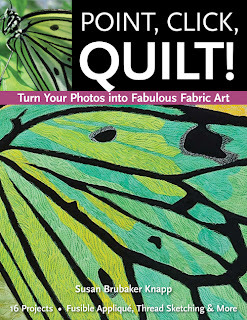 Turn Your Photos into Fabulous Fabric Art will be released by C&T Publishing in mid-July. It includes 16 artful projects inspired by my digital photographs. I teach how to compose and shoot dynamic digital photos from a quilter's perspective. There are lots of fun exercises to help you become a better photographer, and step-by-step directions to help you turn your photos into small art quilts, both realistic and abstract. Most of my projects use fused batik and hand-dyed fabrics, but four projects include innovative materials (paint, Tyvek, Angelina fibers, and foils). The book is 112 pages, and retails for $27.95. My shipping prices are $5 to the U.S. and Canada, and $11 to anywhere else.